I’m sorry I’m only just getting to this, but here is the column I wrote in commemoration of the rising star Sazzy (Osaze Omonbude), who died too soon at age 26. You can read the article at Weekly Trust online, or you can read the hard copy here by clicking on the photo, which will take you to a large copy of the article as published with photos etc. The acknowledgements were left out of the published version, but I’d like to thank Alkassim Abdulkadir, the Coordinator of Guild of Artists and Poets, for gathering and writing the section on GAP, including the comments from Yoye and Lindsey. The photos should also be credited to Korex Calibur of Intersection Media. While I was writing this, I listened to as many of Sazzy’s songs as possible. I thought the best way to commemorate his life would be to quote his own words, and although a lot of those quotes ended up getting cut out of the final version of the article, I thought I’d share the transcripts I made of the lyrics of at least three of his songs here. The first one I’ll post here is the first Sazzy song I ever heard. When our mutual friend Korex posted the link to Sazzy’s music video “Doubt,” on Facebook, I spent about two hours pressing replay. The self-reflexive pidgen, the electronic electric guitar, the voice, and overall production was like no other Nigerian music I’d heard before. Shey na me be dis or be na someone else? Shey na me dey hear, or someone else is there? Shey na me dey talk, or someone else dey yarn? Shey na me dey work for here? Shey na me dey sing or someone else dey sing? Shey na me compose, or someone get de beat? Shey na me get this song…. Shey I get talent, or I be just copycat? Shey I get the skill, or I scramble like rat? Make I come to know, or make I drop am flat? Make I stop to chase this dream. Shey my voice is good, or is it really bad? Shey my style is cool, or is it really sad? I get confidence, or shey na me dey dance? Shey na me get this song. Tomorrow go be a better day. My next obsession was with his perfect techno breakup song “Anymore,” which you can listen to on his Myspace playlist. Baby I can’t do this anymore. Here is his striking final piece, a music video of his hit song “Mr. Chairman,” briefly featuring Supreme Solar. His friend and creative collaborator Korex Calibur directed and edited the music video, which was finished after Sazzy’s death. The end result is very powerful. You can feel the tense energy coiled like a spring in Sazzy. He did not live long, but he seems to have crammed his short life full of music and friendship. In the increasingly rapid editing towards the end of the piece, you can also sense the grief and passion with which Korex edited this final music video. I’m all aboard, do you understand? 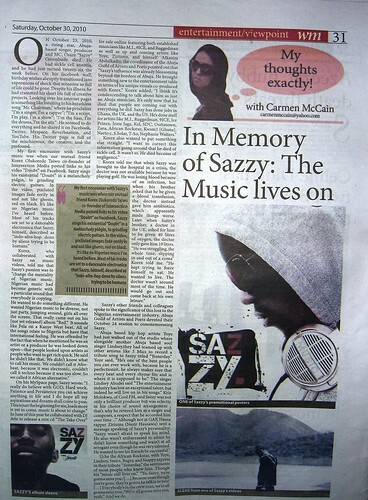 Finally, after his death, Sazzy’s friends, Uche the African Rockstar, Yoye, Lindsey, 5 Mics, Bugzy, and Snappy put together a tribute piece, “Yesterday, which can be listened to at NotJustOk.com. I used to think you have all the time in the world. because she was your African Queen. You made it in this African scene. We can’t begin to ask all these questions. the kind of real person that you are. No doubt that you were meant to be a star. We’re gonna keep connecting wherever you are. And even though you’re gone, you will never be far. Oh Sazzy, why sazzy? I know your family, because I’m your family. And the Almighty God has put you down to rest. Until it is my time, I will keep you in my chest. No matter what they say, to me, you are the best. To me, you are the best. You were a close friend, but now you’re so far away. My heart bleeds, shedding tears, I kneel down and pray. We ask for his blessing, but what’s better than this? Sazzy, you were so good. But you were real to Death…..
For DJ Atta said it too, and it hit me like the blues. My conscious killing me. I should have been here more often. No more hospitals and drugs, just angels in gowns. Sazzy, Mr. Chairman, God bless …. You’re the gospel, put it down. And 5 Mics is doing it too. This entry was posted in Column, Nigerian Music and tagged Abuja, Anymore, Doubt, Mr. Chairman, Naija music, Nigerian music, Osaze Omonbude, Sazzy, Yesterday. Bookmark the permalink.